The Indo-Russian BRAHMOS supersonic cruise missile, whose Block-III variant has perfected a surgical strike capability, is set to further expand its target engagement envelope by attaining a 'near vertical dive capability' to shock the enemy hidden behind mountains. "We want to demonstrate a 'near vertical dive and surround' capability to take the enemy by surprise. While radars do not have 360 degree coverage in the mountains, we would like to show the missile taking a turn in the horizontal axis and decimating the target around the hill. We hope to do this in a year's time," Sudhir Mishra, chief executive officer and managing director of the company, told The Hindu. The capability, he said, would allow the Army to inventively approach their operational plans. On the air version of the universal missile now under development, Mr. Mishra said a dummy BRAHMOS would be test-dropped from a modified Su-30 MKI fighter early next year. By March, the actual missile would be test-fired from the aircraft. The BRAHMOS-II, the planned hypersonic version of the missile, was at a very nascent stage of design, owing to the technological challenges involved in its development. "A preliminary design is being done in the lab and the complete missile may take nearly five years to fructify. But we are at it, nevertheless," said Mr. Mishra. "It is a complex thing to develop, given the fact that as we overshoot the sound of speed, a lot of aerodynamic changes take place. We need new material, as stability and heat-resistance of the missile at these speeds are extremely important. How the propellant behaves at these speeds is a critical question. The avionics has to be properly secured to withstand high temperatures. Data-linking is another key area." Mr. Mishra said the Defence Research and Development Organisation (DRDO) and the BrahMos Aerospace had together invested some $50 million for the development. 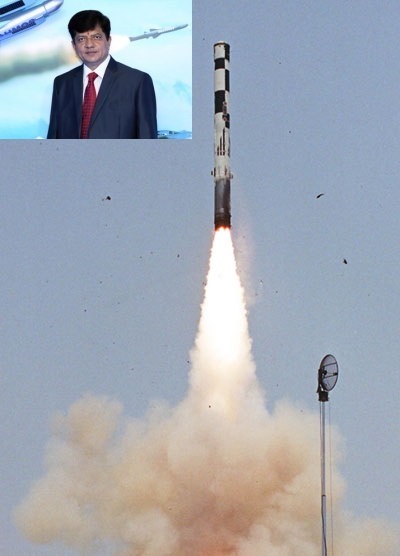 Mr. Mishra said while a few friendly nations in the 'distant neighbourhood' had been shortlisted for sale of the potent missile, it was up to the Russian and Indian governments to take a call on the export of BRAHMOS. "It can happen anytime soon as the new government has made its intent to export weapons clear." Mr. Mishra said Russia, too, would add the missile to its naval inventory when it inducted a new ship.